Click through one more page to select which planner you want and an RTF file will be filled with the information that you provided in the fields. The planner choices are: Portfolio X and Portfolio X Subject. You can read about the planners below. One more thing- The file that you receive is a Rich Text Format (RTF) and requires that you have a software program that supports that format. I think many word processors still support RTF. Next are the column titles. Typically, the days of the week would be placed but perhaps you do not want to do that. Roman numerals or letters could be column titles. The next group are the classes. The homeschool planner that you can generate is based on my Portfolio Planner. In the second window, you will choose from either one of these planners. If you do not close the window, you can download both planners. Below is a list of the pages in the finished Portfolio X planner. The number next to each item is the quantity of pages per form style. Differences between this planner and the basic planner are noted with a star. In the images below, the areas circled in red are not filled in. The file includes the "Class Schedule" a form that is a quarter planner. 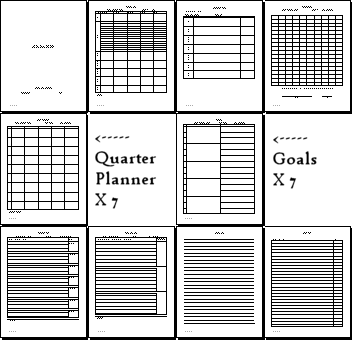 The headings and sides are not filled in because it is a quarter planner. Except for the broad school year span, Quarter Planners do not use dates. The header and sides are for the Keys, which -in the basic planner- will need to be altered to a unique name for the 2nd, 3rd, and 4th page for each subject. Currently the Keys are "Alpha Keyed" A1, A2, etc. 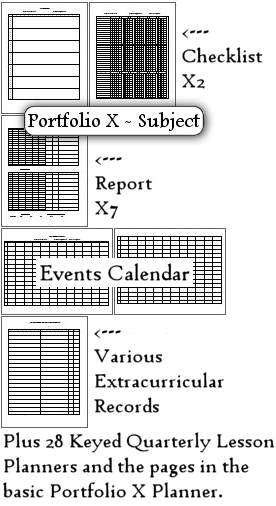 PLEASE NOTE: ONLY "Portfolio X - Subject" contains a complete set of Keyed Quarter Planners. Note: Quarter planners are also called term planners and subject planners at donnayoung.org. In the weekly log, the Week is not filled. You will add that date when the time comes and that time is not today. The second subject in the weekly log has a large ruled area instead of a open cell. I imagine some use this space for some language arts lesson plans. After clicking the Custom Form button, you will have to click though one more page to finish the process and that is when you will choose which planner to download. Tip: Once the file is generated, check it for errors, such as places that were not filled that should have been filled. If it looks good, save the file to your computer so that you can type in it or dress it up before printing. Created with MS Word 2002. This tool makes an RTF file [rich text format]. The sample lists below are not set in stone and every subject that could be on the lists is not included. Please add or take away from them, but always include math, language arts, history (social studies), and science. The arts, religious studies, and state history are not mentioned in the sample lists and those subjects would be examples of subjects that could be added. For the sake of clarity, Language Arts classes are in italic. For the sake of your sanity, the classes that **do not have to be done every school day are green. * English would include grade level composition, grammar, and communication skills. * Reading would not only include reading all sort of books, but also reading would include vocabulary and "critical conditioning,"
*Science and Health are often the same class in the lower grades. **Classes that do not have to be done every school day: I have marked those classes with the color green. My recommendation does not indicate how often to do the classes; that part is up to you, the homeschool planner/parent. A Completely New, made from scratch Grades and Attendance XLS file! Supports up to 40 classes! Uses Course Types! Made for one student in grades up to 8th. "Manuscript Large" -Tthe rule in this set is a mere (just over) 5/8", 1.6 cm.